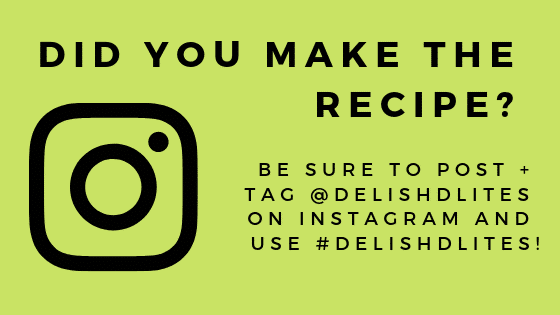 Who doesn’t love good-for-you food that also tastes amazing?! I know whenever I’m trying to lose a few pounds, the only way I’ll succeed is if I feel like I’m not depriving myself of delish things. Contrary to popular belief, eating well doesn’t mean eating rice cakes and fiber cereal. 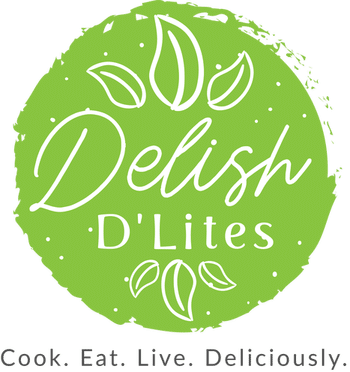 Eating well for me is all about feeding your body with nutritious, delicious food that serves your body well and delights your taste buds. 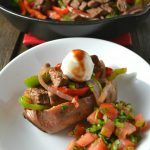 My steak fajita stuffed sweet potatoes do just that! 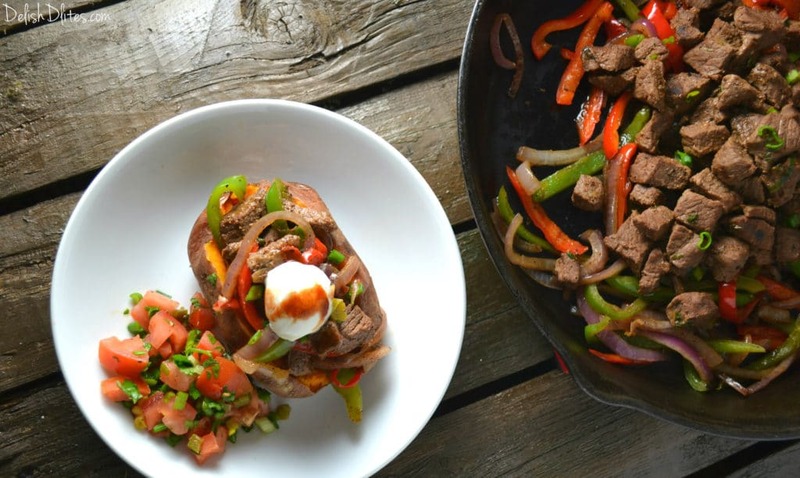 Loaded with lean protein, crisp veggies and natural carbs, these sweet potatoes constitute a perfectly balanced meal, and they taste amazing! 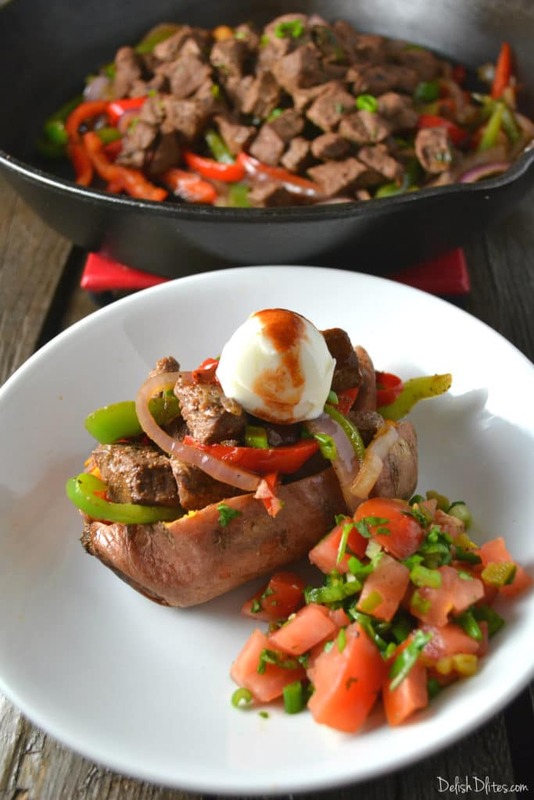 The natural sweetness of the sweet potato plays perfectly with the spicy and savory sirloin and veggie filling. This has become one of my weekly staples, make ’em and you’ll totally understand why! 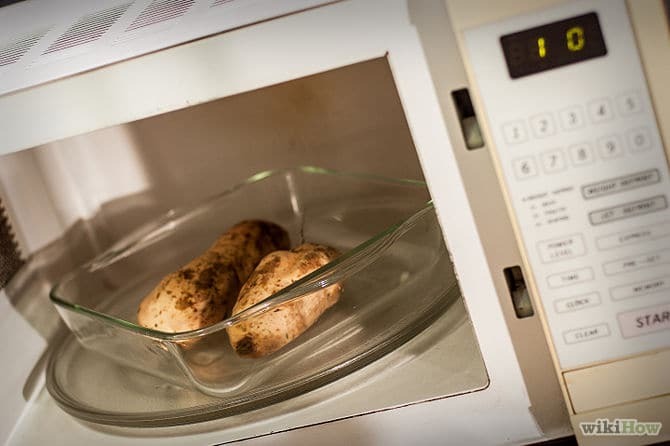 Microwave: Pierce the sweet potatoes with a fork several times, then place the sweet potatoes into a microwave-safe dish. Microwave them on high for 25-30 minutes, or until a knife slides easily into the flesh. Turn the sweet potatoes over once halfway through cooking. 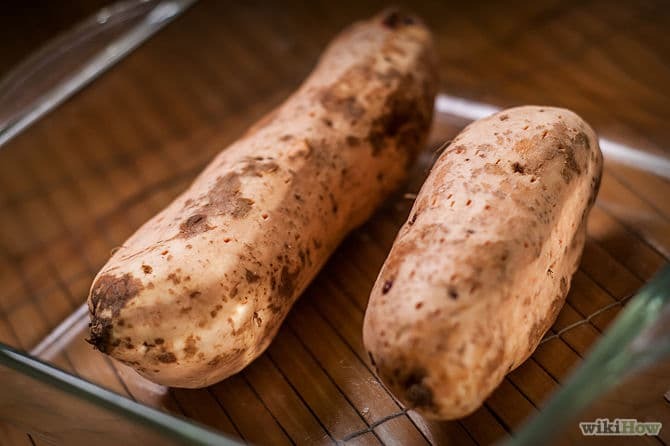 Oven: Pierce the sweet potatoes with a fork several times, then place them in a baking sheet. Roast the sweet potatoes for 45-60 minutes, or until a knife slides easily into the flesh. Season the steak cubes with the smoked paprika, garlic powder, ground cumin, salt and pepper. Toss to distribute the seasonings, then set aside. Heat a cast iron or other heavy-bottom pan on medium high heat, heat 1/2 tablespoon of olive oil. Toss in the peppers and onions, and cook until tender, tossing occasionally. Remove the cooked veggies from the pan and add the other 1/2 tablespoon of olive oil. 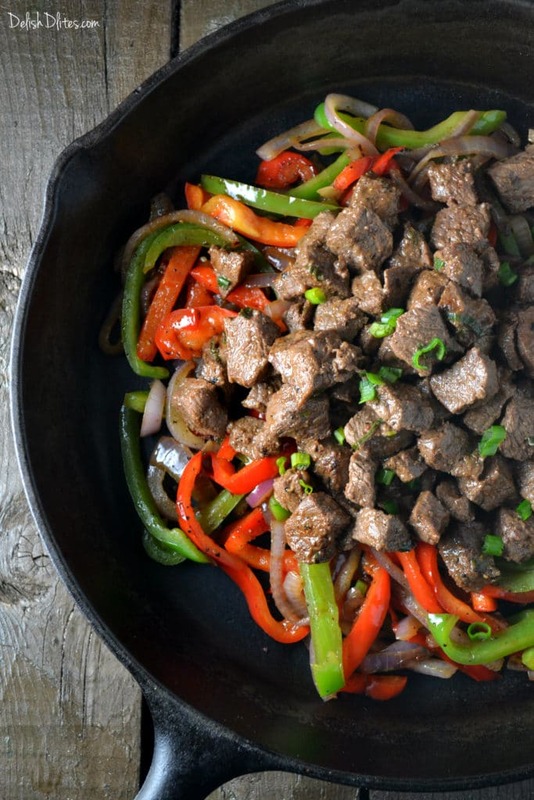 Add the beef, and cook them to your desired temperature. 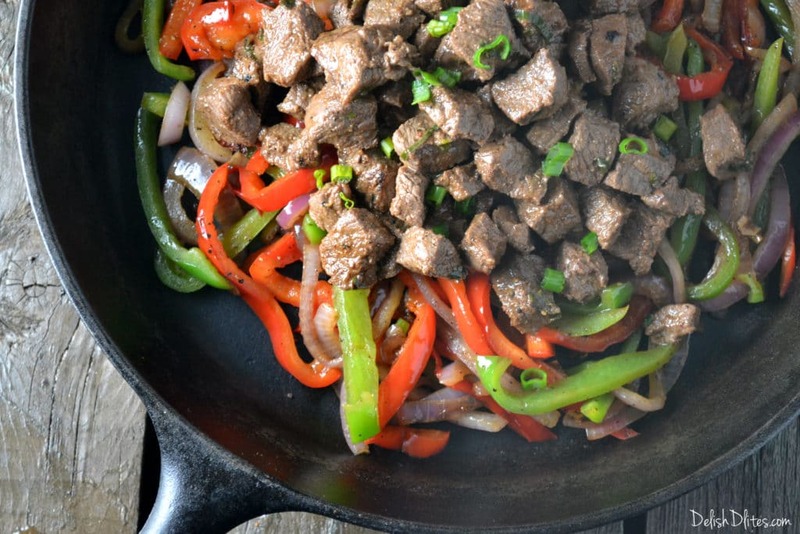 Combine the cooked beef and veggies and set aside. Cut a slit into the center of the sweet potato. Push the ends in to open the potato, then add 1/4 of the filling into the center (and let some spill over the sides!). Serve with pico de gallo, lowfat sour cream and hot sauce (if desired).